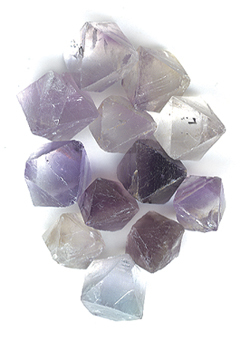 Item #MS-399: Set of twelve Fluorite octahedrons from Cave-in-Rock, IL. Under .50” in assorted natural Fluorite colors with some surface imperfections. Item #MS-666: Approx. 2" pink Fluorite specimen from Navidad Durango, Mexico. Shapes vary. Item #MS-974: Average 1/2"x2 1/2" Calcite and Fluorite specimen. Item #MS-975: Average 1 1/2"x3 1/2" Calcite and Fluorite specimen. Item #MS-1027: Approx. 8"x6"x2" Calcite on Fluorite and Sphalerite (Cave In Rock, IL) of 4.25 lbs. Item #MS-1020: 8"x2.5"x5.5" Fluorite and Calcite on Limestone from Elmwood, TN. Item #MS-1048: Approx. 4.5"x4.5"x2.75" Fluorite on Creedite (Durango,Mexico) of 1.39 lbs. Item #MS-1010: Approx. 15.5"x7.5"x4.25" Fluorite and Sphalerite (Elmwood,TN) of 26.48 lbs. Item #MS-1049: Approx. 4"x2.5"x2.25" Fluorite and Sphalerite of 440 grams. Item #MS-967: Approx. 12"x10"x7" Fluorite crystal with Sphalerite of 31.1 lbs. Item #MS-1009: Approx. 5.75"x5"x3.25" Fluorite on Cookeite (Peru) of 4.10 lbs. Item #GC-11: Approx. 1.5"-2.25" Fluorite on Sphalerite. Shapes and weights vary. Item #MS-1013: Approx. 5.25"x3.75"x3.55" Fluorite specimen (Cave-In-Rock,IL) of 2.75 lbs. Item #MS-1033: Approx. 10.5"x5"x4.5" Fluorite specimen (Illinois) of 7 lbs. 12 oz. Item #MS-1012: Approx. 5.25"x3.25"x2.75" Fluorite with Pyrite of .76 lbs. Item #MS-1011: Approx. 6.25"x4.25"x2.75" Fluorite with Tabular Barite (Anna Bell Lee Mine Cave-In-Rock,IL) of 3 lbs 4 oz. Item #MS-1041: Approx. 4"x3"x1.5" Fluorite, Sphalerite and Barite (Cave In Rock, IL) of 1.10 lbs. Item #AM-MSG-50: 1.5"-2.5" Massage Stone Collection (5 pieces) (Rhodonite, Fluorite, Smoky Quartz, Fancy Jasper & Blue Apatite). Item #MS-966: Approx. 8.75"x6"x3" Phantom Fluorite specimen (Anna Bell Lee Mine, Cave In Rock, IL). 5.5 lbs. Item #MS-954: Approx. 8"x6 3/4"x2 1/2" Sphalerite specimen (Cave In Rock, Il.) with Fluorite. 6.95 lbs. Item #MS-962: Approx. 6.5"x8.5"x3" Sphalerite specimen with Fluorite and Galena (Cave In Rock, Il.). 6.25 lbs. Item #MS-179: Approx. 7.25"x6"x3.75" Sphalerite with Fluorite and Barite (Cave In Rock, IL) of 11.20 lbs.